Over the course of the fall season, while most of the attention around the state was focused on the football field there were actually quite a few kids who were putting work in on the basketball courts, working on their game in preparation for the 2011-2012 high school season. There were 2 programs in particular which drew the majority of the area's boys basketball talent. They were the Integrity Hoops' Flight School (based out of the seacoast and coached by Noah LaRoche) and BST Basketball's NNE Advanced Academy (based out of the Manchester area and coached by Brett Sellingham). Players from both programs have been working hard throughout the fall season. For each of the past 2 Sundays, the 2 programs brought their top players down to the Sports Zone in Derry to play some high-level games. Georges Niang (committed to play at Iowa State) even stopped by to participate in the scrimmages on the first night. These were one last tune-up before the kids disperse back to their respective high school teams for the winter. The NH Notebook was in the house for each of these 2 scrimmages to scout the local talent. Here is a look at who the standout players were at the workouts. Harry Rafferty, 5'11", Berwick Academy - One of the regions top three point marksmen, Rafferty continued to show a smooth, compact stroke from beyond the arc at these scrimmages. He also has a terrific feel for the game and although he is always looking for his shot Rafferty also showed good court vision in setting teammates up for open looks and initiating good ball movement which makes his teammates better. Rafferty also showed that when guarded by smaller players or even players his size he was able to take them inside and finish at the rim. Kamahl Walker, 5'10", Portsmouth HS - Walker was simply the quickest player in the gym, and he used that to his advantage by making plays in transition, either pushing the ball while leading the break or beating the defense down the floor for easy layups. Walker played great defense, jumping the passing lanes for a number of steals and he also continues to show a smooth pull-up jumper and an array of athletic moves going to the rim. Once he gets a step on his defender he is just too quick off the dribble for anyone in NH to handle. Marcus Swedberg, 6'7", Moultonborough Academy - Swedberg has been doing a lot of workouts with BST Basketball over the course of the summer and fall, and you can really see the progression in his game. He still has some work to do, but Swedberg has developed into a very effective face-up 4 man. On one play he faced up and drilled an 18 footer, and on another play he made one hard dribble to the rim, then hit a step-back jumper from just inside the three point line. He also blocked shots, rebounded well and is also becoming a more consistent player. Trevor Glassman, 6'1", Bedford HS - Glassman was effective at moving without the basketball, constantly running off screens in order to free himself up for jumpers off the catch. He shot the ball well from the outside off the catch or the dribble. Glassman also had one of the best finishes of either workout, as he made a circuis shot while driving to the rim and throwing the ball up with his left hand while also drawing the foul. Tom Nason, 6'10", Berwick Academy - Nason continues to show good development, and really played some good, consistent basketball in the paint and has also improved his footwork inside. While he still has to work on using his size to his advantage better by going up stronger at the rim and finishing through contact, there's no question that with his size, skill and ability to run the floor he has a lot of upside. Nason once again showed his go-to move - going left to right across the lane with 1 dribble before going up with a running baby hook shot with his right hand. The move was very effective, as he was able to either make the shot or draw a foul nearly every time. Then just when it seemed like he could only go right with his moves inside Nason shook things up by making a strong move going to the rim with his left hand. 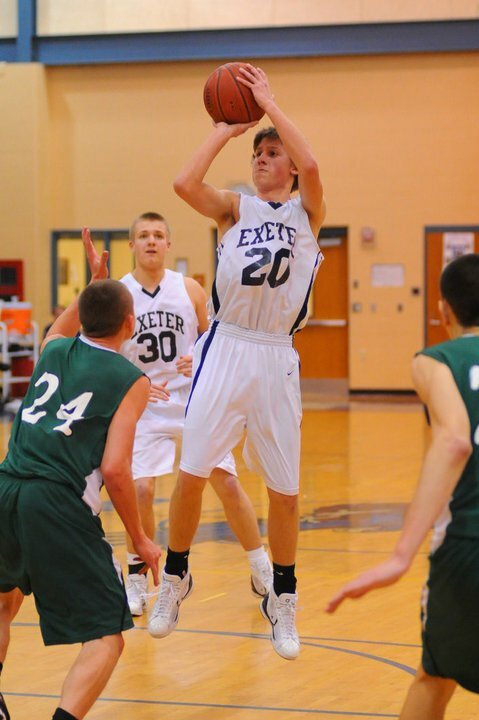 Matt Barr, 6'1", Exeter HS - Barr (pictured above) was clearly one of the breakout players at these workouts. We already knew he was good, but over the course of the summer and fall by working with Integrity Hoops he has taken his game to another level. The fast paced, free flowing style of play these games were played at were right up Barr's alley, as he made some excellent dishes on the break to teammates and also got out ahead of the break and stroked three ball after three ball. He beat the buzzer on one shot off the catch, and showed good court vision on some great passes. Barr also showed a good mid-range game, driving to the rim in the half court before making a nice dish inside and on another play displaying a killer pull-up jumper, stopping on the drop of a dime and hitting the 15 footer after faking the defender out. Jack Preston, 6'5", Nashua High South - Preston impressed us with his play at the Hoops for Hope league this summer, and at these workouts he continues to put in the work, getting better and showing that he's one of the NHIAA's top junior players. The 6'5" power forward played physical in the paint, going up for some tough rebound and finishes inside. Preston did a nice job of driving the ball right at the defender and drawing fouls at the rim or finishing through contact. He ran the floor well and also faced up from the outside and put the ball on the floor effectively. Christian Iozza, 6'3", Proctor Academy - Iozza has developed a very nice mid-range game, and he was able to find open seams in the defense by taking his man off the dribble and moving without the ball by flashing to the elbows and making plays from there. He hit the three and also made a nice floater in the lane after a strong take on the baseline. Roger Larrivee, 6'6", Bedford HS - Larrivee is a finesse big man who has really gotten a lot better over the course of the fall by training with BST. He blocked a number of shots defensively and also stepped outside and knocked down a handful of shots in the 18-20 foot range. He played hard on both ends of the floor and in addition to hitting shots off the catch he also made a strong take to the rim off the dribble, although his footwork still needs work on post moves. Collin McManus, 6'9", Bedford HS - McManus used his size to carve out space for himself in the paint and collected rebounds on both ends of the floor. He ran the floor well and on one play where he was the trailer on the break he was able to jump up toward the rim, grab the rebound and lay it back in all in one motion. He also blocked shots well, but needs to make more of an impact on offense for a kid his size. Tim Preston, 5'10", Nashua High South - The younger brother of Jack Preston, Tim followed up an impressive performance at the NERR's Elite 75 showcase by playing some more good basketball at the point guard position at these workouts. Despite the fact that he had the ball in his hands so much and played the game at a fast pace Preston still made very few mistakes with the ball, as he always seemed to be in control and got the ball where it needed to go. He is a pass-first point guard who sets his teammates well off dribble penetration and is more than capable of scoring the basketball on his man off the dribble as well. Preston showed a smooth crossover and made some nice dishes that lead to good looks for teammates. Andrew Lechner, 6'2", Pinkerton Academy - Lechner is a hard worker who wants to get better and he more than held his own when matched up against some of the state's top players. He's a versatile player who can play inside or out and showed a good in-between game, by using shot fakes and hesitation dribbles to create open looks in the mid-range area. Lechner is also a good defender, and always seems to block at least 1 or 2 shots every time out. Max Kirsch, 6'2", Timberlane HS - I like this kid's game. There's nothing flashy about it, he's not the biggest or the most athletic kid out there. But for a freshman who's already 6'2" he's very quick and shoots it well from the outside. You can also tell he's a coach's son (his father Dave Kirsch is the new boys basketball coach at Timberlane) because he's one of those blue collar players who just plays hard all the time, makes the extra pass, hustles, is unselfish and has a high basketball IQ. Kirsch is a good defender and is used his long arms to block shots. In past articles I've mentioned who some of the top freshmen are this season, well Kirsch is a kid who belongs in that group. Possibly the best freshman in the state Ben Judson is actually going to school in Massachusetts (St. John's Prep) but if he went to public school he'd be going to Timberlane. If he did go there, him and Kirsch together for 4 years would have been just what the Owls needed to turn their program around.